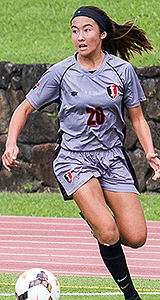 Offensive Player of the Year: Kylee Kim-Bustillos, Iolani, forward, Sr.
Every team that faced Iolani knew that you had to slow down Kylee Kim-Bustillos if you hoped to win against the Raiders. Seeing that the Raiders went unbeaten during the season and captured their fifth state title, one could say the Iolani senior forward was unstoppable this year. 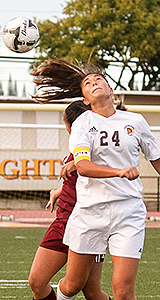 Kim-Bustillos, who will play collegiately at California State University, Sacramento, scored 24 goals in her senior season and was selected as the ScoringLive All-Hawaii Girls Soccer Offensive Player of the Year. 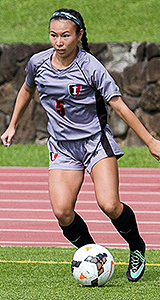 The Iolani forward closed out her four-year prep career in style, scoring two goals in the Raiders' 2-1 championship win over Punahou in early February. Along the way she scored 55 total goals and was twice selected as the Interscholastic League of Honolulu's offensive most valuable player. "She's definitely been a threat against us for the last four years," said Kamehameha coach Missy Moore. "She always played really well against my Kamehameha team and her work ethic and off the ball movement and ability to finish goals was outstanding." 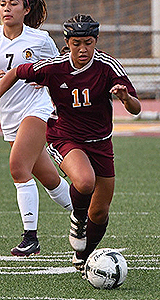 One thing that sets Kim-Bustillos apart from other goal scorers was her feel for the game. 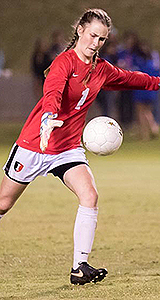 "Her movement off the ball to get a pass from one of her teammates is spot on," said Moore. "She knows when to move, when to take people on and when to pass." Outside of her play on the field, she was also an invaluable mentor for a young Iolani team that had seven freshmen on its roster. 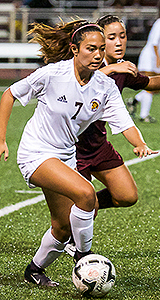 "I think Kylee is more than just a great forward, she's a great team leader and great example for her teammates," said Mililani coach Ray Akiona. "I think that collectively that's what makes her an outstanding player." 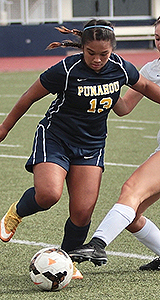 Defensive Player of the Year: Allison Candelario, Punahou, fullback, Sr.
Punahou's Allison Candelario just always seemed to be in the right place at the right time. 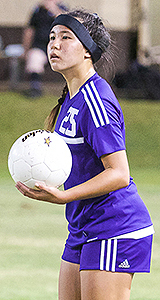 Candelario, a senior center back, was a sentry for one of the best defenses in the state and was chosen as the ScoringLive All-Hawaii Girls Soccer Defensive Player of the Year. During the regular season, Candelario and company gave up just three goals, which helped the Buffanblu win the league title and earn a first round bye in the Division I state tournament. 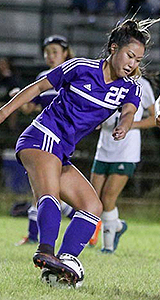 The stellar defensive effort by the Buffanblu was best displayed in their semifinal 3-0 semifinal win over defending state champion Pearl City, when they shutout a team that had three goal scorers with 17 goals or more on the season. 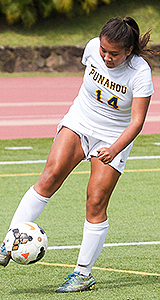 Candelario also has an impressive resume, earning First Team honors three times as a fullback in the Interscholastic League of Honolulu Girls Soccer All-Stars. "She's had that starting position for several years now and she's definitely one that's hard to get around," said Kamehameha coach Missy Moore. Moore added that Candelario could process what opposing offenses are trying to do quickly to cut off scoring opportunities. "She's not the speediest kid, but because her positioning is so good, that sets her up for success." Mililani coach Ray Akiona was also impressed with what Candelario's abilities. "I like her style," he said. "I think she's aggressive, but she's also calm enough to know when to drop back and when to step back. 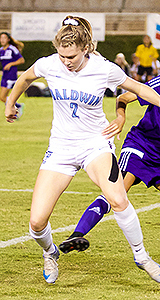 She's got the ability and technical knowledge that makes her a well-rounded player." 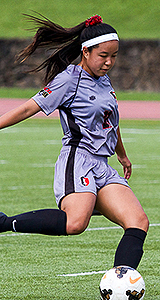 Taking the "L" was something that the Iolani girls soccer team never had to do this season. Instead, the Raiders went 13-0-3 en route to their first state title since 2013, their fifth crown overall. Iolani's championship run and impeccable record was why Iolani coach Kristin Masunaga was selected as the All-Hawaii Coach of the Year. "That's an obvious choice for me," said Mililani coach Ray Akiona. "Kristin has always been in the top. Her teams are well prepared, she has a coaching staff that supports her, is very calm as far as things going on and she doesn't get too emotional. She's always in control and she's got her team well situated." 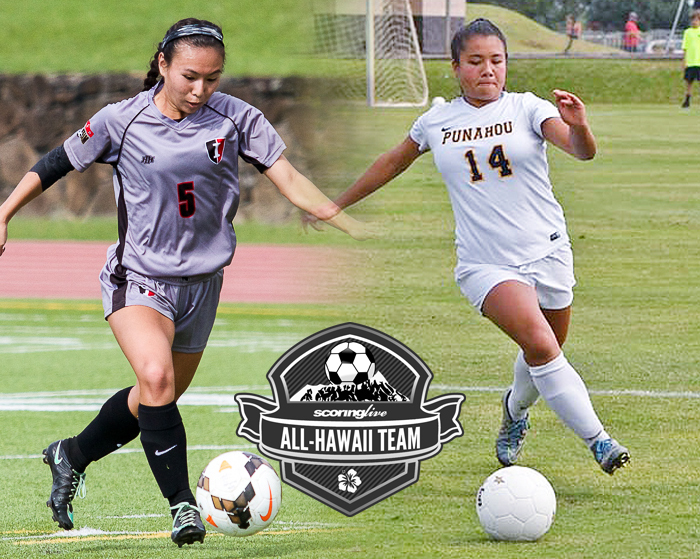 The Iolani team that won the Division I title also featured a group of seven freshmen, which included First Team selections Mia Watanabe and Kelsey Wong. "Looking from an outsider perspective, the ability to get her young players to buy in and learn the system is definitely a big props to her," said Kamehameha coach Missy Moore. "I think she did a good job of mixing the older kids with the younger kids. She had nice system that tried to contain and possess the ball majority of the time and I thought she did a great job with her team."